Back in July 2012 I stumbled across something called pix magazine and was so taken aback by it’s absurd fixation on girlie accessories for female photographers, other wise known as photographers, that I felt compelled to lay into it. My problem with that edition of the magazine was its focus on pretty fripperies like flowery camera straps, pretty shoes and make-up and seemed to be written from the point of view of people who really didn’t have a clue what photography is beyond an excuse to buy pretty things. For a photographic magazine aimed at women photographer it featured very few photographers talking about their work or giving guidance on how to break into a male-dominated industry. When the Spring 2013 issue dropped into my inbox I took another look. I have to say I’m pleasantly surprised with the transformation. This time around there is more focus on working photographers. This edition focusses on travel photography, so there’s plenty of scope for pretty pictures and they are present in abundance. 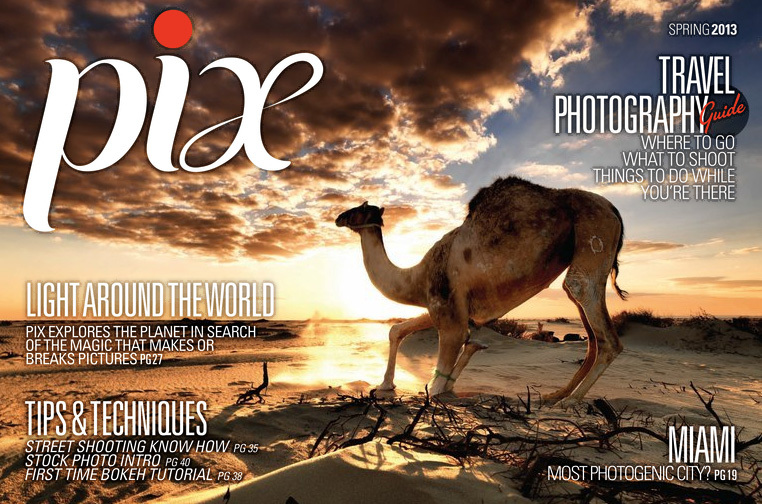 The latest edition of pix magazine. Big improvement! The copy is still fairly light and a little fluffy for my tastes; photographers talking about capturing emotions and moments is something of a cliché and I still wish there was a magazine out there for people (of either gender) wanting to know more about the stories behind photographers who’ve made a success of their work. It would be nice to know the stories of photographers who have failed once or twice so we could all learn from their experiences. Stories of photographers who “love to capture the moment” aren’t really that interesting. There are still articles on buying groovy kit, but then I suppose a magazine has to attract advertisers if it is to survive. I remember when I was much younger a magazine entitled PIC (People In Camera) which was interesting because it interviewed photographers in depth and pix could do more of that and still talk about accessories. Credit where credit is due though, a change of editor has worked wonders and it would be good to see this direction pursued further. It might even become something I would spend time reading for the sake of a good read, rather than for the sake of a good blog article. I took a look, Pix doesn’t seem half bad, though somewhat amateurish. However, they do manage to pack a lot into fifty-odd pages. Thanks for the info.